Tempting as a V-6 is, the 2.0-liter, turbocharged Luxe with the Essentials and ProAssist packages is a potent, comfortable luxury bargain, costing $41,555. The Q50 Pure replaces the base model, which is only available with the 2.0-liter, turbocharged inline-4. The Luxe replaces the Premium and will likely be the best-selling trim for the Q50. It's available with either the 2.0-liter turbo-4, a 300-horsepower version of Infiniti's 3.0-liter, twin-turbocharged V-6, or with a V-6-powered hybrid system. The Sport brings some stylish trimmings and a standard V-6, while the Red Sport 400 carries on with a 400-horsepower V-6. Infiniti’s light exterior update adds stylish new front and rear fascias tailored to the trim level—Pure and Luxe get their own look, while Sport and Red Sport 400 get something more aggressive—while there are new 18- and 19-inch wheels that are dependent on model. New interior touches, bring an increased sense of refinement without addressing the Q50's rather unattractive center stack. Small tweaks don't take anything away from the 2018 Q50's stylish interior and exterior. Infiniti's efforts to separate the Q50 based on sporty style and interior luxury works well—it feels like there's a larger visual gulf between the Pure/Luxe and Sport trims than in most of the Q50's competitors. The Pure and Luxe get chrome accents and smaller aerodynamic touches in the fascia, smaller foglight surrounds, 17- or 18-inch alloys, and a body-color exhaust surround at the back. 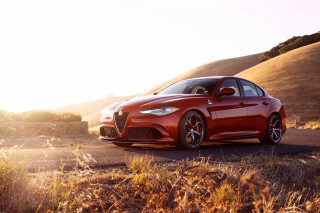 The Sport and Red Sport 400 replace the normal chrome with dark chrome, increase the size of the front chin spoiler and foglight surrounds, add black mirror caps, use standard 19-inch wheels, and ditch the body-color exhaust surround in favor of a—you guessed it—black finish. Changes aside, the Q50 remains one of the segment's more attractive vehicles, perhaps second only to the new Alfa Romeo Giulia. We like the predatory look of the headlights and their LED accents, although the new LED running lights above the foglights look redundant. Most of the Q50's important curves remain unchanged, which is for the best. There are a laundry list of mild changes in the cabin, designed to improve the sense of quality and luxury. The Q60-sourced steering wheel has thinner spokes and more attractive detailing, and the stitched dash and the Infiniti logo on the shifter are nice changes too. Smaller changes amount to revised lighting for the instrument cluster and updated ambient lighting. Aside from the new steering wheel, the Q50's cabin layout hasn't changed much. A two-screen infotainment system occupies almost the entire center stack, and is flanked by two stacks of buttons. The double-screen setup is not very attractive, especially with the wood trims available on the Luxe grade, but it functions well enough. Unfortunately the Q50’s material quality still isn't up to Germany's standards. The panels and parts simply don't feel as solid as a Mercedes-Benz C-Class or BMW 3-Series, and it remains difficult to ignore that much of the switchgear feels better suited to a Nissan Altima or Maxima than it does a premium model. Wonky steering and a less-than-enthusiastic handling character overshadow three excellent engines. Despite its Japanese heritage, Infiniti takes a very American approach to power—there's a lot of it. 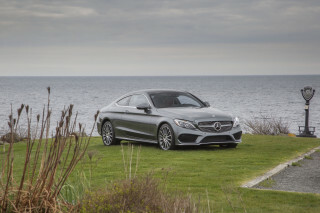 Each of its engines enjoys a hefty advantage over its nearest rivals. 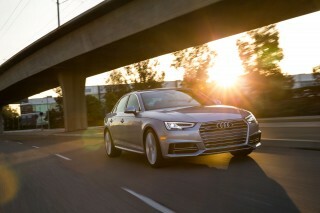 With 208 hp and 258 lb-ft of torque, the base 2.0-liter outguns the BMW 320i and Audi A4 2.0T Ultra. 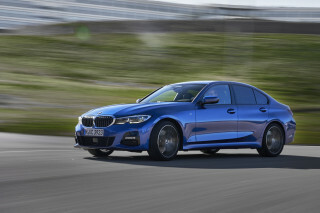 The 3.0-liter, 300-hp V-6, meanwhile, takes on the mid-range 4-cylinder engines in the 3-Series and A4, and comes up with a very large advantage. And the Red Sport 400? 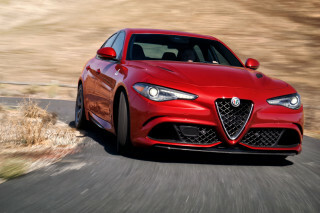 Its 3.0-liter V-6 produces more boost and more power—400 hp and 350 lb-ft of torque—than the standard 3.0-liter, more than anything else in this segment, aside from the high-dollar Mercedes-AMG C63, BMW M3, and Cadillac ATS-V.
As of this writing, we've only driven the Red Sport 400 model. 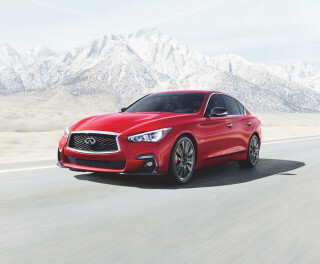 The 3.0-liter’s power is effortless across the rev range, and off the line, there's a minimal amount of turbo lag, adding to the Q50's aggressive, but manageable, driving character. This engine also sounds spectacular too with a smooth, sonorous V-6 exhaust note that makes you forget the raspy 3.7-liter from Q50s of yesteryear. The Q50 has a good balance between handling ability and ride comfort. The body's behavior is predictable through the bends, rolling progressively as the steering angle increases and leaning toward understeer when pushed hard. It does all this without beating its driver or passengers senseless. But the Q50 is also light on feedback through the chassis. As the weight transfers laterally, fore, and aft, it's hard to get a sense of what's happening through the seat of the pants. The Q50 is almost too cosseting, although we doubt you'll have a problem with that if you aren't routinely attacking back roads. All Q50 powertrains work alongside a 7-speed automatic transmission, and it's here that things start to fall flat. 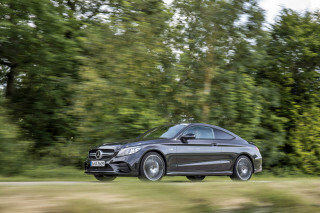 The 7-speed is smooth and relaxed in everyday driving, and does a fine job of keeping the engine where it should be. But call on the transmission for something more dynamic and it simply doesn't satisfy. Upshifts are too slow and undramatic, which is a problem—when you call a car the “Red Sport 400” you better deliver on the sportiness. Infiniti's Direct Adaptive Steering continues to be a problem, too. The steer-by-wire system is difficult to manage in a dynamic sense, lacking the kind of feedback through the wheel that lets a driver know what the front wheels are doing. In Sport+ mode, the extremely adjustable steering setup weights up well, giving some semblance of heft, but it remains in the uncanny valley, doing a fair approximation of a normal rack without convincing its driver or instilling confidence. And unlike the transmission, which is fine for everyday use, DAS feels skittish in normal conditions, requiring little corrections at freeway speeds. The good news is that DAS is only an option, even on the Red Sport 400. The Q50's traditional electric steering feels much more predictable and is more communicative when driving aggressively. While steer-by-wire systems will likely be a major part of future vehicles, for right now, we'd recommend going with the tried and true. Infiniti offers a hybrid powertrain for the Q50, albeit in very small numbers. The Q50 Hybrid mates a 3.5-liter V-6 to a 1.4-kwh battery and a 50-watt electric motor for a combined output of 360 hp. Offered in rear- or all-wheel drive, the Q50 Hybrid is the most efficient Q50, but rarest. We haven't yet driven a Q50 Hybrid, but will report back once we do. Extremely comfortable seats and a spacious trunk help the Infiniti Q50 stand out in a very competitive segment. The front seats are very impressive. Nissan's NASA-based tech results in seats that are deeply, deeply comfortable but still offer plenty of support for aggressive driving. The seat cushioning is somehow both soft, so you sink right in, but also firm enough that you aren’t tossed around during aggressive driving. They’re excellent. We'd happily wile away many hours behind the Q50's wheels, especially in the Red Sport 400, which takes the space-age seats and finishes them in quilted, semi-aniline leather upholstery that looks as good as it feels (very). In back, head room is an issue but second-row leg room is perfectly acceptable for the class. There's also plenty of space in the trunk, with 18 cubes of total cargo volume. Beyond the simple abundance of space, it's worth pointing out that the Q50 is a very quiet, composed car at freeway speeds. There's some wind noise, but engine and tire roar, even with the largest 19-inch wheels, is rarely an issue. Suspension impacts are well controlled, too, with the Q50 doing a good job of isolating its driver from road imperfections. Material quality is something of a mixed bag. Leather lines the dash, although it's not the same quality as what you'll find on the seats or steering wheel, with Infiniti relying on what feels like a more durable hide. Piano-black buttons flank the center stack and don't feel quite as premium as they should, while it's hard to not look around the cabin and see assorted bits and bobs from the Nissan parts bin. Those are, of course, minor complaints—we expect most owners will be thrilled with the Q50's cabin. The Infiniti Q50 has a very advanced suite of active safety systems to keep car and driver out of harm's way. Like other luxury vehicles, the Q50 has an impressive suite of active safety systems designed to keep occupants safe while also reducing the strain on the driver. 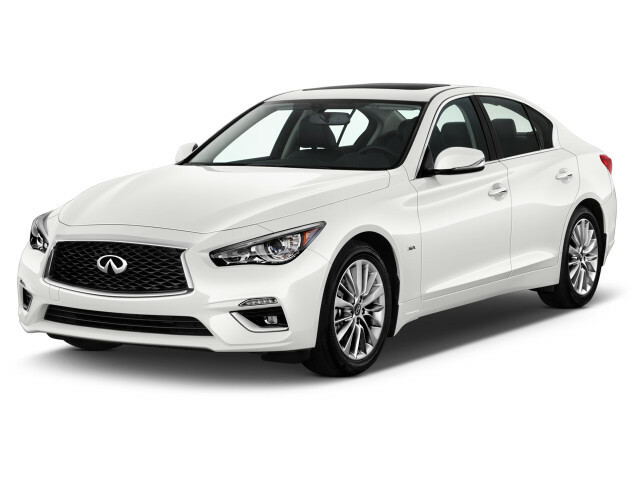 Most new-car buyers should be familiar with adaptive cruise control, lane departure warning, blind-spot monitoring, and forward collision warning with automatic emergency braking—the Q50 offers all off them, but the best features require living with Direct Adaptive Steering. But it also has Distance Control Assist, a trick feature that will automatically maintain a safe distance to the car in front as soon as the driver lets off the gas. If the vehicle in front is slowing or stopped, DCA will either maintain a safe gap or bring the Q50 to a complete stop. That gives owners one of the big benefits of adaptive cruise control without actually needing to engage the whole shebang. And while it has no impact on safety, we really like the “Star Trek”-like shields-up graphic that pops up in the instrument cluster display when the driver switches on the active safety systems. Labyrinthine option packages aside, the 2018 Infiniti Q50 is available with a lot of desirable and advanced tech. For the extra goodies, you need the Q50 Luxe. Four-cylinder examples start at $37,455 for rear-wheel drive and $39,455 for all-wheel drive, while the V-6 variant costs $39,855 with rear-drive—add $2,000 for all-wheel drive. The Luxe trim doesn't add much equipment on its own—there's a standard sunroof, and maple wood trim replaces Lunar Black plastic—but it does grant owners access to a pair of impressive option packages. The Luxe trim also serves as the basis for the Q50 Hybrid, which starts at $51,505. The Essential Package is aptly named—for $2,450 on the 2.0-liter Luxe, $2,600 on the 3.0-liter Luxe, and $2,500 on the Sport, it adds navigation, a heated steering wheel and front seats, and a split-folding rear seat across the board. The Essentials Package also adds leather upholstery to the V-6-powered Luxe, a feature that's standard on the Sport (which explains the price differences). Speaking of the Performance Package, it's a $1,500 option and requires the Essential Package on the Sport, while it's standard on the Red Sport 400. This pack adds an adaptive suspension, larger brakes, and steering-wheel-mounted paddle shifters. The Sensory Package comes in both Luxe and Sport varieties, but is a V-6-only item (including the Red Sport 400). The small price difference between these two, $2,950 for the former and $2,650 for the latter, reflects the leather upholstery the package adds to the Luxe—leather is already standard on the Sport. Beyond that difference, this package adds a 16-speaker Bose stereo, a power tilt and telescopic steering wheel, auto-dimming exterior mirrors, a memory function for the driver's seat, and an upgraded climate control system. The ProAssist Package (and illuminated kickplates, for some reason) are a prerequisite for the Sensory Package, except on the Red Sport 400, which includes ProAssist as standard. Not the most efficient sedan on the market, but the 2018 Infiniti Q50 prioritizes power without sacrificing too many mpg. 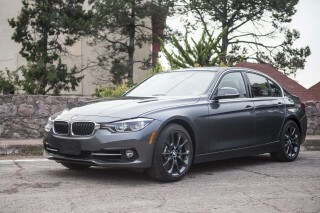 That 4-cylinder base model is rated at 23 mpg city, 30 highway, 25 combined. Adding all-wheel drive drops it slightly to 22/28/24 mpg. The V-6-powered Luxe and Sport drop further to 20/29/23 mpg with rear-wheel drive and 19/27/22 mpg with all-wheel drive. 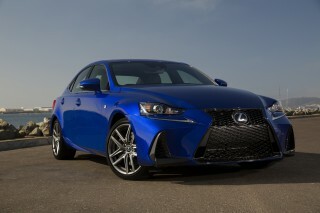 The 400-hp Red Sport 400 returns 20/26/22 mpg. Adding all-wheel drive to the most powerful Q50 drops the city rating by one mpg while retaining the highway and combined estimates. The most efficient version of the 2018 Infiniti Q50 also is the rarest. The Q50 Hybrid is rated at 27/32/29 mpg with rear-wheel drive, or 26/30/28 mpg with all-wheel drive.